La Maison de la Dune is set in a remarkable site, on the top of the dune, to the west of the beach of Petit Bec. It overlooks Conche des Baleines. It is a former forest house built in 1852 and renovated in 2009. It used to be a shelter for the employees of the Forests and Waters Office. 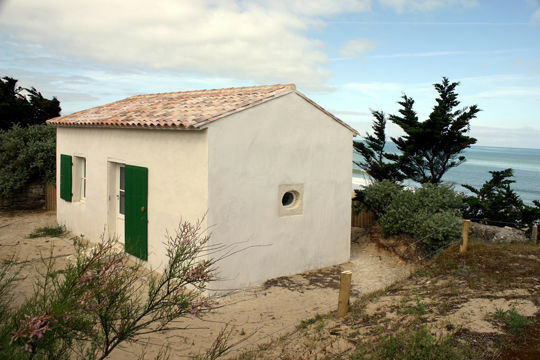 La Maison de la Dune is a former forest house built in 1852 and renovated in 2009. It was used as a shelter for the French forestry commission employees. La Maison de la Dune is set between the forest and ocean, and provides exceptional views of La Conche and Phare des Baleines. Several information boards to be found in la Maison de la Dune describe the delicate rampart constitued by the dune against erosion threatening it, the role of the foreshore, the white dune, the grey dune, the wooded dune, the plants of the dune and their secrets, the quiet people of the dune and forest. A botanical path allows to identify and discover the characteristics of the local flora to be found in the surrounding area of La Maison de la Dune.